Maximum size: 92 mm (extrapolated from shell length of Leeward Is. animals); main island animals probably seldom exceed 54 mm. Distribution: Big Island, Maui, Molokai, Oahu, Kauai, Niihau, Pearl & Hermes Reef and Midway: circumtropical. 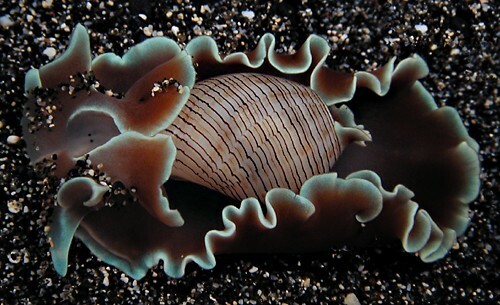 Taxonomic notes: It's referred to as the "paper bubble shell" in Hoover, 1998 & 2006 and may have been first reported from Hawaii in Pilsbry, 1921 (as Hydatina physis staminea). Photo: Mike Severns: found by CP in Napili Bay tide pool; Sept. 8, 1995. Note 1: Shells of this species show strong red fluorescence under ultraviolet light (395 nM).